Black Bean Tacos just got a whole lot more exciting! These are loaded with flavor, they’re a breeze to prepare and the filling only needs to cook for 5 minutes! In other words say hello to a new quick dinner. I know what most of you are probably thinking. Black bean tacos. BORING! My family was thinking the same thing until I made these. My kids were hoping I was making the same beef tacos and were sad to hear it “we’re having black bean tacos for dinner” but after one bite of these they were both like wow these really are so good! 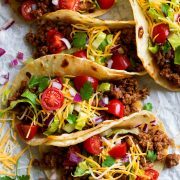 My one daughter said she even liked them better than the tacos we normally always have (the ground beef or turkey) Even my meat loving husband really liked these tacos too and of course I was a big fan! So it was an all around healthy dinner win and a new dish to add to the rotation! In a medium saucepan combine 2 cans drained and rinsed black beans, 1 cup salsa, 1 1/2 tsp chili powder and and 1 tsp cumin. Simmer mixture for about 5 -10 minutes, stirring occasionally. Slightly mash beans if desired. Use the Filling for Tostadas too! This black bean taco filling would also make great tostadas, just buy the pre-made tostada shells by the tortillas at the store and layer on these same toppings. Blend it all together in a food processor and that’s it! 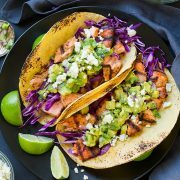 These are the fastest, easiest tacos! 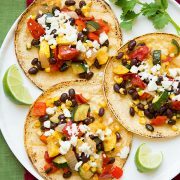 Canned black beans are briefly simmered with salsa, spices and garlic then layered over tortillas and finished with a bright lime crema and your favorite toppings. It's a vegetarian recipe everyone will love! In a medium saucepan combine black beans, salsa, chili powder and cumin. Simmer mixture for about 5 -10 minutes, stirring occasionally. Slightly mash beans if desired. Meanwhile in a food processor pulse together avocado, Greek yogurt, cilantro, lime juice and garlic until cilantro is finely minced. Season with salt and pepper to taste (if you want the sauce thinner you can add in 1 Tbsp water). To assemble tacos, on each tortilla layer black bean mixture, avocado cilantro lime crema, lettuce, cheese and tomatoes. Serve immediately. Refrigerated salsa can be found in the produce section or in the refrigerated latin foods section of the grocery store. If using homemade use one that includes tomatoes, onions, cilantro and garlic. This is about the top 1/3 portion of one medium bunch of cilantro, so use mostly leaves and some stem. This is my preferred method for cooking corn tortillas for tacos (although those pictured were just warmed and browned with a flame): I brush the tortillas lightly with olive oil then cook them in a skillet over medium-high to medium heat until they begin to get golden brown spots on the bottom then flip and cook opposite side until lightly browned. Nutrition does not include lettuce, cheese and tomatoes.